Let your imagination run wild with Creative Genius. 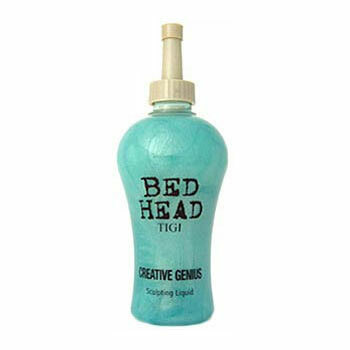 This funky liquid will shape your hair without losing the softness, and never leaving a heavy build-up. Smooth into damp hair and blow dry for a light natural hold or apply to dry hair and blast with a blow-dryer for a firm intense hold. Smooth in damp hair and blow-dry for light natural hold. Scrunch in dry hair for firm, intense texture. Sculpt into a work of art! Aqua (Water), Polyquarternium-46, Proplyene Glycol, Carbomer, Triethanolamine, Isoteateth-20 DMDM Hydantoin, PEG/PPG-17/18 Dimethicone, Parfum (Fragrance), Benzyl Alcohol, Coumarin, Limonene, Methylparaben, Panthenol, Tetrasodium EDTa, BEnzophenone-4, CI 77019 (Mica), CI 77891 (Titanium Dioxide), CI 42090 (BLUe 1), CI 19140 (Yellow 5).